It is what it is, let’s face it: America is run by the Mob. This is the most powerful corporate structure, where blood runs thicker than water, the Family Syndicate. It emulates and embraces feudal hierarchy: the Kings and Queens, Princes and Dukes, the Ruling Family. It is why there was an American revolution, separation from the blood lineages of royalty and monarchy… a utopic move towards a free and open democratic system, governed by representation and the ideals of social participation. Fast forward: stare deep into the dark pit of the TRUMP Corporation and you will see the steely will of Mobsters intent on amassing wealth and power at the People’s expense, ready to destroy everything and anyone in their path for the glorification of The Family. You simply don’t mess with The Family. The reality of a crime family mob syndicate that has infiltrated the highest levels of government should startle us all. While the Godfather romanticized the Italian Mafia, exposing its greed, violence, and allegiance to blood, we could never have imagined this movie adapted for the mainstream political stage. In the current narrative, the secret dark alley exchanges between Mafia families has risen to slimy deals conducted at the top level of American and Russian politics. The Collusion Story features the TRUMP & PUTIN syndicates bound together in an Art of the Deal with the Devil, a quid pro quo of hacking for sanctions, involving the dirtiest, low-life scoundrels from Moscow to Washington engaged in backroom plots in smoke-filled rooms. This is our government at work, this is what’s left of democracy. 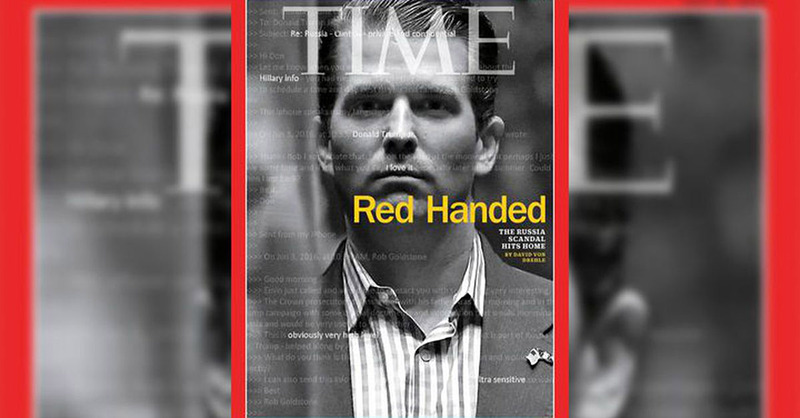 The now notorious June 9th meeting between Junior, the Son-in-Law, the Russia-tied Campaign Manager, the ex-Russian counter-intelligence officer, the Russian lawyer with ties to the Oligarchy, the business guy from the Russian Miss Universe pageant, etc, etc reads like a cheap Russian spy thriller, except its just one mere episode of the TRUMP Show. Amidst thousands of sordid scenes of danger and secret underworld transactions, this is just the latest chapter in an epic gangster story that stretches back to the corruption scandals plotted by TRUMP’s father Fred in the 1970s, masterminded by the infamous evil lawyer Roy Cohn who defended Joseph McCarthy in the 1950s. The TRUMP Show then led to the mega casino bankruptcies of Atlantic City that destroyed contractors, investors, and the public trust. The TRUMP syndicate over the past 40 years has left a trail of money and blood, with its unabashed laundering of the American System. The only ray of light in the current Crime Story of the Century is that the TRUMP Family Syndicate may very well come crashing down in one sweeping Federal investigation. The only problem, is that TRUMP Corporation is so deeply embedded into the body politic, that removing this cancer may cause a fatal hemorrhage, transforming America into a sea of carnage in the wake of the greatest Mob plot in history.